Stump neuromas form when nerve tissue is severed, and tries to regrow. In the foot, this most commonly occurs during surgery to remove a neuroma, but certain penetrating injuries can sever the nerve accidentally as well. Nerve tissue, contrary to popular belief, does attempt to regenerate by forming tissue growth off of the severed end that seeks the other severed end, in an effort to reestablish a connection. If the gap between the severed ends is too far, then the nerve cannot re-link. The tissue growth then forms into a ball, or nub, which can be very sensitive if it sits in an open area near moving tissue. Neuromas and stump neuromas have similar symptoms, which include the feeling of a painful lump that may also burn, tingle, or even feel numb. Typically this is felt in the middle or ball of the foot depending on the nerve location after surgery, or near the site of injury if the nerve was severed in an accident. In the case of neuroma surgery, several centimeters of nerve tissue is removed (typically a couple of inches). The severed ends cannot possibly link, and the chance of a neuroma forming is high if precautions are not made. These include ensuring that the nerve is cut under tension, so that the severed ends slide back deep into tissue like muscle, where it has a much lower chance of forming a stump neuroma. Some surgeons advocate applying a cap over the severed nerve ends, although this author finds this step unnecessary. 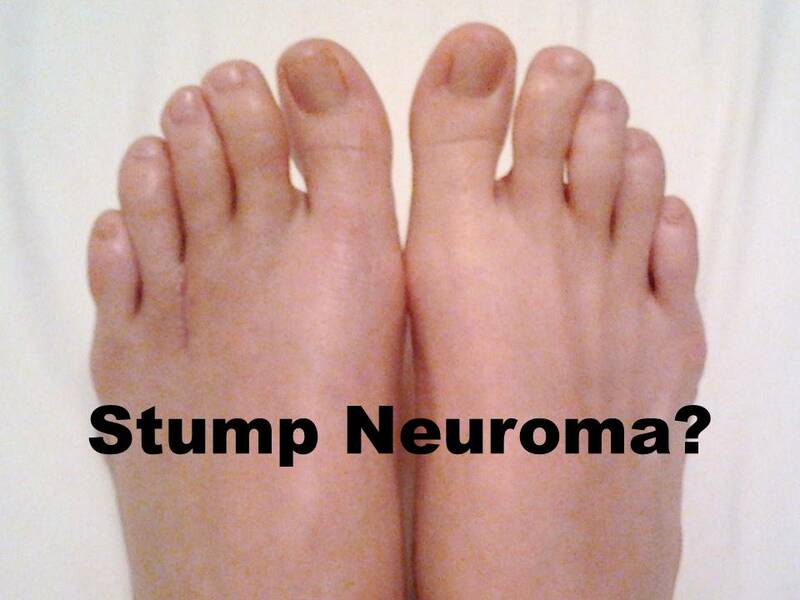 If a stump neuroma does form, whether after surgery or an injury, it can lead to pain that is difficult to treat. Steroid injection or agents designed to destroy the nerve ending may help. Otherwise surgery is needed to remove the stump neuroma, with great care being taken to ensure that a new stump neuroma does not result from this surgery.